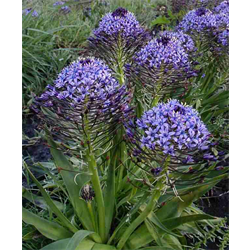 Common Name: Portugese Lily or Peruvian Squill Suggested planting rate: one bulb per 1 / ft sq. Notes: Scilla peruviana bulbs get their foliage in late summer. Beautiful, blue flowers that last for weeks. Best for borders, edging, or naturalizing. Tolerates shade.